The larger part of this issue consists of Gerald E. Bentley, Jr.’s supplement to the Blake Bibliography of 1964. We thought it would be more convenient for readers to have this material collated separately, and so this issue of the Newsletter comes in two parts. We welcome further additions from readers; these will be published in the summer issue. 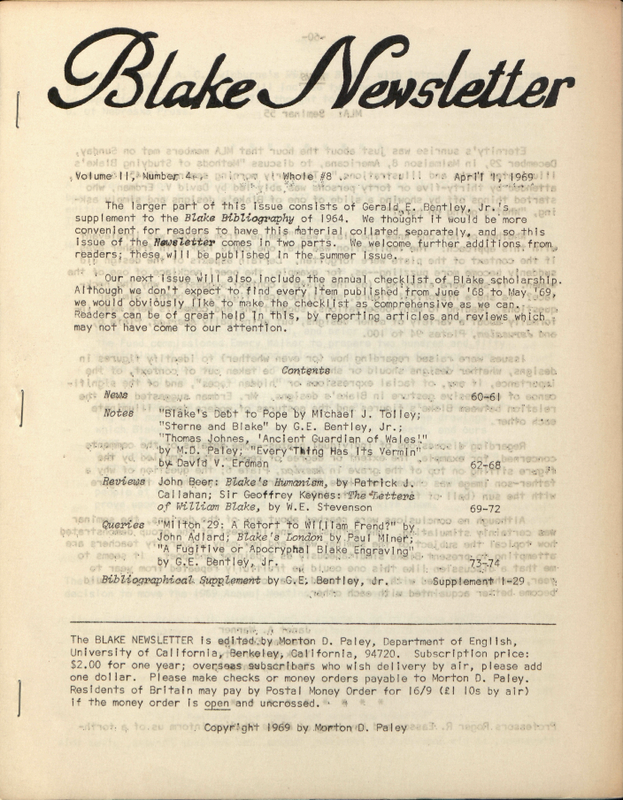 The BLAKE NEWSLETTER is edited by Morton D. Paley, Department of English, University of California, Berkeley, California, 94720. Subscription price: $2.00 for one year; overseas subscribers[e] who wish delivery by air, please add one dollar. Please make checks or money orders payable to Morton D. Paley. Residents of Britain may pay by Postal Money Order for 16/9 (£1 10s by air) if the money order is open and uncrossed.